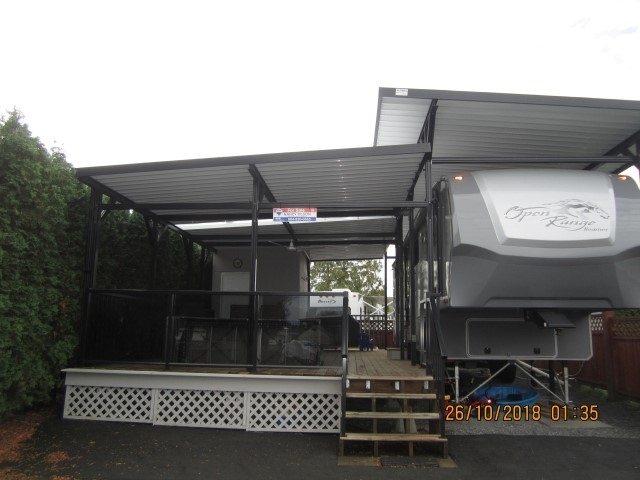 "The Everglades Resort on Hatzic Lake - Beautiful User Area with a 2013 'Open Range Roamer 5th Wheel' (stunning) on a very private lot with a 32 x 16'5 deck, covered with an aluminum awning (Black Trim) and shed. Goes with 5th Wheel package and furniture inside and out... Nicely set up. Lots of work done on this lot.... a 10 Plus. Just pack up and enjoy!!!! The Everglades is a gated community with clubhouse, common area, parks playground and private boat launch. Lots of fun to be had boat, swim, fish and close to Sandpiper Golf Course and many other activities. Only 1 hour and 15 minutes from Vancouver. Fees including taxes are $1467 per year. Why go camping elsewhere, own your very own get away."